Certain wastes such as nuclear wastes, are so hazardous that their disposal creates a major challenge requiring considerable technical skill and understanding. Their effective isolation in the ground depends on the properties of the surrounding clays. 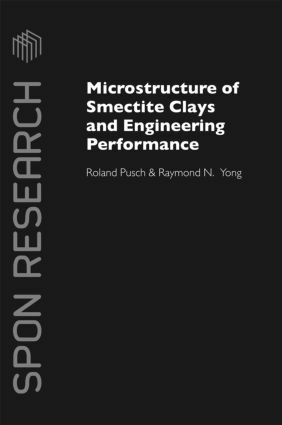 This authoritative book explains the detailed function of clay-based engineered barriers, gives a number of examples of the design and construction of successful sites, and sets out conceptual and theoretical models for the prediction of their performance. It begins by providing a scientific grounding in the relevant aspects of clay science and successively moves onto the practicalities, while retaining the scientific slant. It will be useful for students, and invaluable for research institutes, specialists in environmental protection agencies and consultants in the field of disposal of hazardous waste. Professor Roland Pusch is currently the Scientific Head and Managing Director of Geodevelopment International AB, Sweden. He has worked as professor in soil and rock mechanics. Professor Raymond N. Yong has authored and co-authored 7 textbooks, and over 500 refereed papers in various journals. He has received the Killam Prize from the Canada Council (Canada’s highest scientific prize), the Legget Prize from the Canadian Geotechnical Society, the Dudley Award from ASTM, and the Canadian Achievement Award from Environment Canada.